Don't Just Measure Engagement. Improve It. Identify opportunities for your organization to improve engagement and get the most out of your valuable workforce. Engaged IT employees do what’s best for the organization: they are 30% more willing to innovate, 39% more likely to stay at the organization, and report 29% higher productivity. The result is improved business satisfaction, better products/services, and saved costs. Info-Tech's program is designed to help you improve engagement, not just measure it. If you're interested in developing and maintaining a high performance IT culture, this is the best way to do it. Customized to you, data-driven, objective and actionable. This program is included in your advisory membership. Speak with an Info-Tech Executive Advisor to select the survey that's best for you, and get started now. A report that provides an overall breakdown of your IT organization’s engagement results and engagement driver results. IT organizations with strong employee engagement are more productive. Rather than guessing how engaged your employees are, get a comprehensive view of your IT organization’s engagement levels. 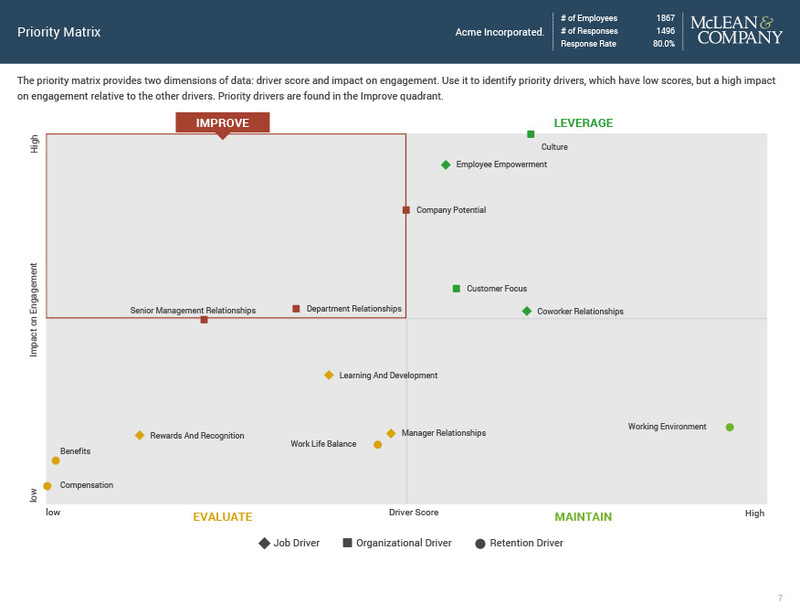 By correlating engagement scores with driver scores the Priority Matrix identifies which drivers have the greatest impact on your IT organization’s engagement levels. 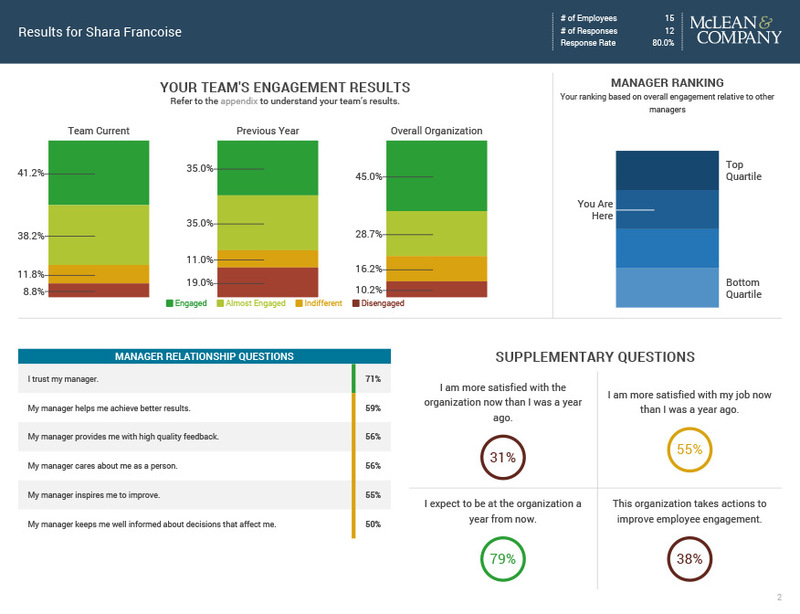 A report that provides a breakdown of engagement results for each department (team) and/or location. 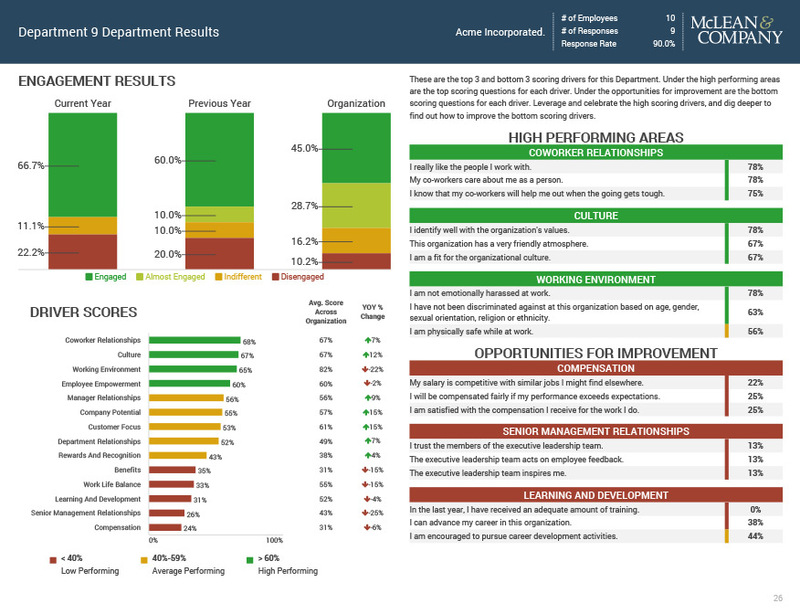 Breaks down the overall engagement results to the department or location level. Action plan by identifying their specific engagement strengths and opportunities. A breakdown of results for managers with sufficiently large staff. Results specific to each manager identifies which managers have the most engaged employees and those where employee engagement is lower. Don’t just measure your Employee Engagement. Improve it by action planning. Info-Tech's dedicated team of Program Managers will facilitate this Diagnostic & Action Planning program remotely, providing you with a convenient, low effort, high impact experience. with Info-Tech's facilitated Employee Engagement Action Planning Workshop. Info-Tech Research Group's expert analysts will come onsite to help you facilitate this Diagnostic & Action Planning program, interpret the results, and help you start to implement change. In 5 days, we take you through all of the phases of this process and ensure that you have a road map in place to improve the areas highlighted in your custom report.